Aquaholics Zanzibar is the first & only surf school on the island and caters for surfers of all levels. Our Hotel is a popular hang out location after a good surf session with the team of Aquaholics Zanzibar. Aquaholics Zanzibar is the first & only surf school on the island and caters for surfers of all levels. Our Hotel is a popular hang out location after a good surf session with the team of Aquaholics Zanzibar. Combine your stay with some time in the waves and learn how to surf, improve your skills or simply have a fun session out in Zanzibar’s reef breaks. Beginner and advanced surf spots are found mainly in Dongwe which is only a 30 min drive north from the hotel. Crystal clear warm water and a consistent waist high wave are waiting for you and perfect for first time surfers and refresher surf lessons. The outside section can hold a decent head high wave for more advanced surfers. There are also surf spots in Jambiani, which work perfect for intermediate and advanced surfers in the right conditions and can be reached by a local sailing boat right from the hotel. Aquaholics has a range of over 15 beginner and advanced surfboards to choose from depending on your surf level. The wave season is very similar to the windy season on the island and works from December to the end of March and again from June to the end of October. 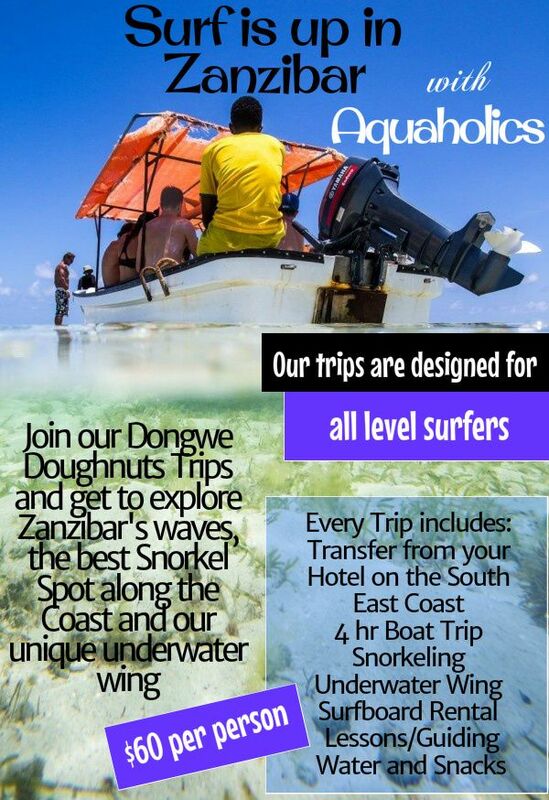 The most popular surf trip is the famous Dongwe Doughnut Trip, which is an approximate 4 hour boat trip that offers more than only surfing. A covered fiberglass boat picks you up on the beach of Dongwe where the fun really begins. First the guys will introduce a truly unique activity known as the underwater wing. Get towed behind the boat while holding on to a wing, that easily glides you underwater to a depth of your choice and brings you back up to the surface just as easy. Practice your dolphin-like moves and even throw in a spin or two and discover your mermaid skills. After a go on the underwater wing you make your way to the best snorkel lagoon along the south east coast. A lunch stop and snorkel will reboost your energy to get ready for a surf. The surf lessons begin as you leave the boat and jump into the indian ocean once again. The instructor will guide you to your chosen spot and help you catch your first waves or guide you to the outer reefs. Aquaholics also offers Surf Only Trips, where you will head out straight to the surf and spend as much time as possible to get your surf on. Once arrived at the hotel our management can help you book a surf trip for a groovy surfventure. Of course you can also contact Aquaholics Zanzibar directly for bookings and a tour schedule. More info on Surf Holiday Packages can be found here (Unique Surfcamps) and on the website of Aquaholics Zanzibar.